Saturday Nights! 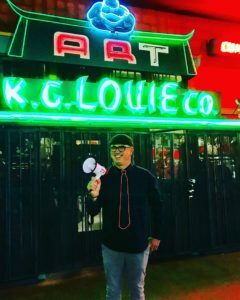 JOIN US for a nighttime bus tour of neon signs, movie marquees and permanent installations of contemporary neon art through Downtown and Hollywood. Developed by MONA beginning in 1985, this narrated tour points out neon’s aesthetic dimensions, placing them firmly within the context of 20th century Los Angeles cultural history. 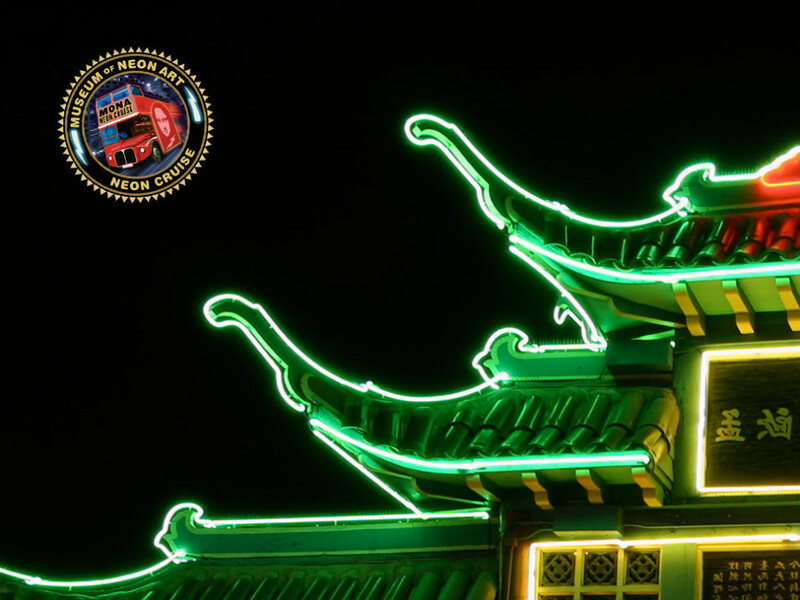 From the classic movie marquees of downtown Los Angeles’ theater district to the glittering lights of Hollywood and the glowing pagodas of Chinatown, you will see outstanding examples of contemporary neon art as well as innovative electrical advertising on this award-winning tour. Jump on board the top deck of a convertible British bus and let your knowledgeable guide delight you with history and anecdotes about the urban electric jungle of L.A. Now in its 17th consecutive year, the Neon Cruise begins in the Historic Corridor of Downtown. 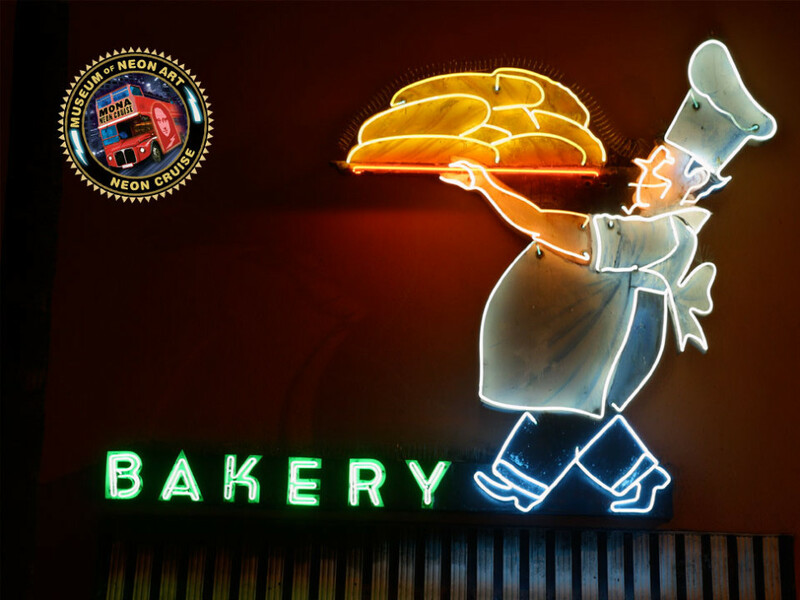 The unassuming 1940s and 1950s set of neon signs are original to LA’s Chinatown and were added by various shopkeepers over the years, but were removed by a long-running tenant who donated the signs to the Museum of Neon Art. The duo was welcomed into the museum collection, but was only there for a few years until the building’s new owner restored the structure’s architectural and rooftop neon. 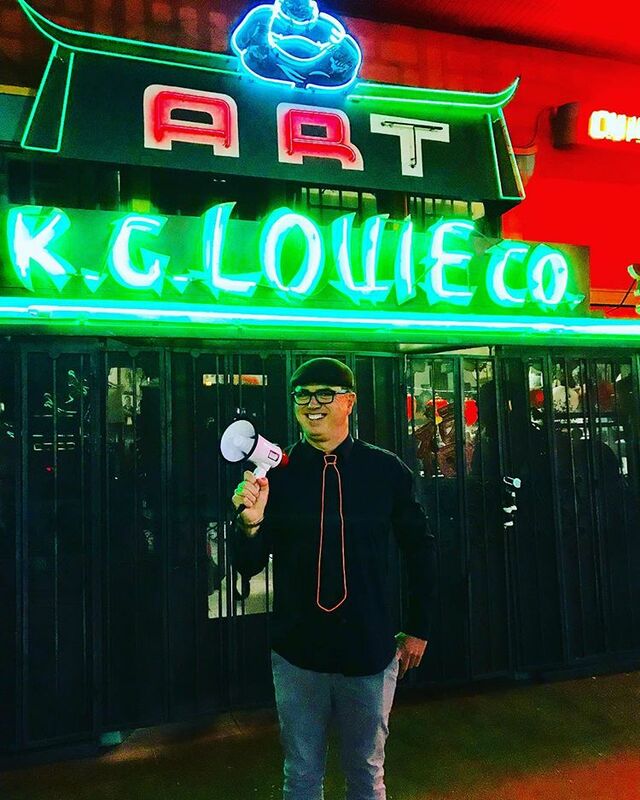 With trust in the more neon-friendly owner, the museum de-accessioned the Gift Fair Chinaware neon signs and returned them to their original perches over Gin Ling Way in LA’s Chinatown. 2015 brought neon lighting back to the restored façade of Clifton’s Cafeteria. It mimics the original neon pinstripes from the 1930s while also celebrating what turned out to be a historic discovery in the building’s basement – what could possibly be the world’s oldest operating neon tubes. Hidden behind a false wall and hardwired into the building’s electrical system, the secret neon tubes date to 1935 and have never been turned off in that time. The building’s owner plans to move the vintage tubes to a more public location. Arguably the most grand theatre on the West coast is the namesake of the city, the Los Angeles Theatre. The ornate structure opened on the eve of the Great Depression in 1931 with a filigreed, neon vertical sign and matching, grand marquee. Over the years the marquee was replaced with a more streamlined, window-box-style sign with a prominent clock at it crux. The Broadway Theatre District has gone through its share of ups and downs, but the Los Angeles Theatre is still a grande dame and its neon vertical sign and marquee again shine brightly thanks to the 2004 restoration by the Museum of Neon Art and the City Redevelopment Agency. The fancy Hollywood and Vine neon sign once promoted a restaurant within the Equitable Building, but that restaurant is now long gone. 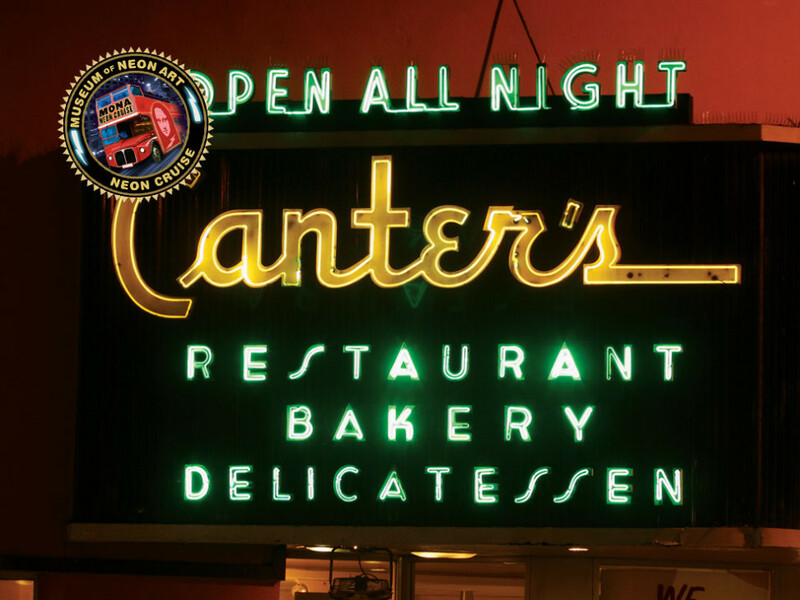 The modern neon with working clock and glittering stars once pronounced the word Diner, then Bar and now Lofts as its premier, promotional function changed with time. Don’t ignore the miniature, animated-neon Capitol Records building topping the sign. One of the great bars from Hollywood’s Golden Age still haunts the corner of Hollywood near Vine in the 1930 Pantages Theatre building and its iconic neon sign has never burned more brightly. Stylistically, the design is a visual cacophony with multicolored neon tubes as a background for the streamlined lettering and boomerang design of its connected F and R. For those who believe that lettering cannot be art, we point to the Frolic Room’s amazing neon signage every time. *In your shopping cart, please enter a CELL PHONE NUMBER where you can be reached on the evening of your cruise. MONA MEMBER DISCOUNT: Enter MEMBER at checkout for $10 off your Classic Neon Cruise. Your membership will be verified. Number of member-priced tickets per membership level: NEON: 1 ticket ARGON: 2 tickets NEON MERCURY: 3 tickets HELIUM: 3 ticketsKRYPTON: 4 tickets PLASMA: 2 FREE tickets XENON: 4 FREE tickets + unlimited member discount tickets Want to become a member? Click Here. You will receive a reservation confirmation email from the museum with detailed instructions on the exact meeting location. Cruises usually meet at 7:00PM in DOWNTOWN LOS ANGELES and return around 10:30PM. 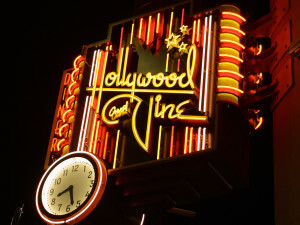 HOLLYWOOD NEON CRUISE meets at 6:30PM in Hollywood and returns around 10PM. Due to limited seating on the bus, requests for cancellations or transfers must be made TWO weeks prior to the selected cruise date. MONA reserves the right to cancel the tour due to insufficient ticket sales, in which case your ticket will be fully refunded. 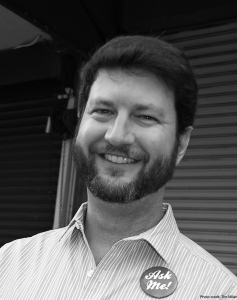 MONA is a 501(c)(3) non-profit organization. MONA is a 501(c)(3) non-profit, your donation is tax deductible.